Alright, let's get this straight right from the start. There is only one acceptable vegetable to serve with Thanksgiving Dinner: Microwaved Frozen Peas (MFP). Not canned or fresh peas. Only microwaved frozen peas. They are a basic requirement; if there was any true justice in this world, it would be a Federal Crime not to serve them. I've been told that there are some people who don't like peas. I'm not joking and stop calling me Shirley. Doubtlessly this lie is perpetuated by the Frozen Corn & Carrot Council. But Crabby is not heartless. I am willing to concede that some people, mouth breathing troglodytes no doubt, would like to have a vegetable choice at Thanksgiving. So today I bring an elegant option. The fact that it uses one of Mother Nature's most repellent vegetables only serves to display my beneficence as well as the wisdom and glory of frozen peas; but I digress. Place a medium sized skillet over medium high heat. After 1 minute add the olive oil and swirl to coat. Add the onions and saute, 3 - 5 minutes, until they just begin to soften. Add the Brussels sprouts and salt, saute for an additional 5 minutes. Sprinkle in the 5 tablespoons of water, shake the pan to distribute and then cover. 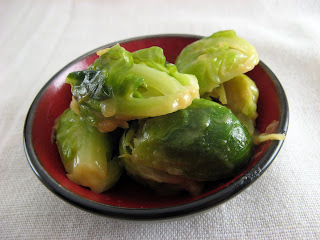 Cook over medium heat for 7 minutes, or until the Brussels sprouts are fork tender. Note: Don't peek until the end of the 7 minutes. You may need to add more water and re-cover the pan if the sprouts aren't quite done. While the sprouts are braising, using a small whisk, mix together the mustard and maple syrup in a small bowl. When the sprouts are fork tender add the sauce and stir to coat. Transfer to a bowl and serve with freshly ground pepper. There you go, pretty easy all in all. I have three suggestions for this recipe. First, I found the mustard a bit overwhelming, cut it back to 1/8 of a cup if you're not a big Dijon fan. Second, and I think that this would make a huge difference, instead of braising in water, use some champagne. It would add a nice dimension to the dish. 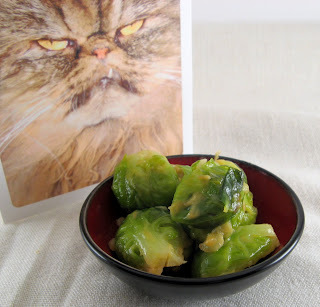 Third, don't let the sprouts sit in the sauce for too long before serving, they turn "gloppy" pretty fast. OK, crablings, a fast post with only a week to go before the big day. I know the pressure's building, but just remember, you can do it, you can cook. Next time, Bird Talk. I'm going to try these..OH insists he hates them, (I adore them!! ), but these look soooo good! Two things. First, I just took the MSN wine test and failed miserably. Yes, you too can drink! Second, I love Brussel Sprouts. Crabby if you can get a picture posted of the Brussel Sprout plant people would be surprised. In my youth, I remember going to my Uncle's farm and picking them T-Day morning because they didnt taste good until after the frost and freshly picked from the most phallic of plants. Figured using the word PHALLIC would get you to move on this.